Book your holiday cottage today for stays in September, October or November and take £50 off your booking instantly with our exclusive voucher code. Where do I use my Mulberry Cottages voucher code? Mulberry Cottages provide cottages and accommodation in locations all over the UK including the South East, the South, the West, the South West, East Anglia, middle England and the North. So whether you’re heading to Kent, Sussex, London, Dorset, Hampshire, the Isle of Wight, the Cotswolds, the Forest of Dean, Somerset, Devon, Suffolk, the Lake District or any other county in England, you are sure to find comfortable and accommodating cottages for you and your loved ones to enjoy. Search for your cottage by destination or type and discover options that sleep 1-4, 5-9, 10-15 and 16 and over, as well as accessible holiday cottages, made with guests who have disabilities or reduced mobility in mind. On the Mulberry Cottages website, you can also discover large holiday houses perfect for celebrations with the whole family, you can also find large holiday homes, grand and country houses and group accommodation. If you’re looking for something a little different you can find quirky accommodation, old church buildings, retro style homes, and ‘big weekend’ homes. As well as all this you can also check out houses for popular times of the year including May half term, summer and Christmas. 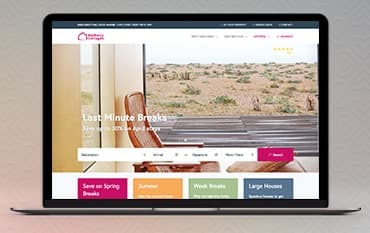 You can also browse through new arrivals, pet-friendly cottages, cottages with hot tubs and swimming pools and even city breaks, extras and experiences. Whatever type of guest house you’re looking for you can find it at Mulberry Cottages, and with plenty of offers available, you can save money on your stay too. Mulberry Cottages has a great collections section where you can browse through pages and pages of Christmas cottages, New Year's Eve cottages, summer cottages, large holiday cottages, quirky holiday cottages, coastal cottages and dog-friendly cottages. Choose your ideal collection and discover an array of different cottages that are right for you in locations all over the UK. Whether you’re after a romantic setting, a place perfect for a rural retreat, cottages in locations ideal for golf enthusiasts, or cottages together so you can enjoy some time together with a fellow couple of family while enjoying your own space too, you can find it all in the Mulberry Cottages collections section. Known as ‘The Garden of England’, Kent earns around 58 million visitors each year with its charming appeal and easy access to London and Surrey. As England’s oldest county Kent beholds a fascinating collection of historic castles as well as beautiful coastlines and quaint country villages. Mulberry Cottages have a magnitude of places for you to stay in and around Kent including plenty of city and seasides locations. Boasting a selection of 250 cottages in total, you’ll easily find the perfect size, shape and type of accommodation for you and your guests. If you want to go all out and experience an authentic country retreat in Kent, why not a stay in a converted barn, a quirky coastal house, a rural lodge or even a large country stately home? Do something a little different for your next adventure and choose a Mulberry Cottage in Kent. Mulberry Cottages’ range of accommodation in Sussex is perfect for nature lovers looking for a quiet escape in a beautiful scenic area. While in Sussex you can stay in a postcard little cottage and explore stunning surrounding areas during the day. There’s also a variety of activities to enjoy such as walking, bird watching, horse riding, cycling and even canoeing. Sussex is home to the Battle of 1066 with a vast history to uncover too, visit the site of the Battle of Hastings, the old Cinque Port of Rye and the notorious Bexhill. If you prefer the seaside to the country then check out the Coastal Sussex Cottages in places like Camber Sands, Rye, Winchelsea and Chichester. You can also find Sussex Cottages in Brighton! This bustling cosmopolitan city has one of the most sought out beaches in England and is the perfect place for a seaside holiday and a nice little city break too. If you do not pay the amount due in relation to your booking by the due date Mulberry Cottages will assume that you wish to cancel the booking, in which case they will be entitled to keep all of the deposit already paid. Mulberry Cottages is a holiday home rental company who supply cottages, homes, barns, large houses and many more types of accommodation at locations in every corner of the UK, from London to the Lake District. Whether you’re looking for a city break, a rural retreat, a party home in the country or a nice space to get away for a bit you can find the ideal holiday home at Mulberry Cottages. And, if you book online with a voucher code from us you could save a fortune on your stay as well. We are constantly on the hunt for Voucher Codes for Mulberry Cottages to help you with your money saving. Our experts check dozens of sites for secret codes including NHS discounts, student sites & social media channels saving you time & money!